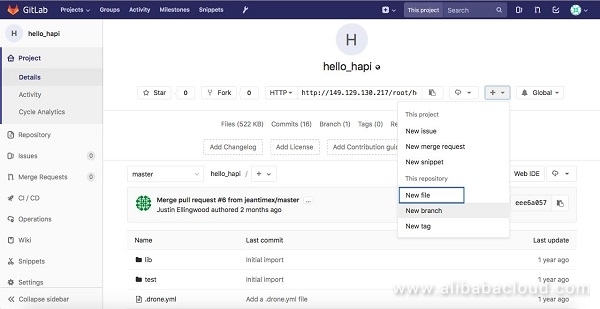 In this tutorial, we will set up GitLab for continuous integration on Alibaba Cloud. 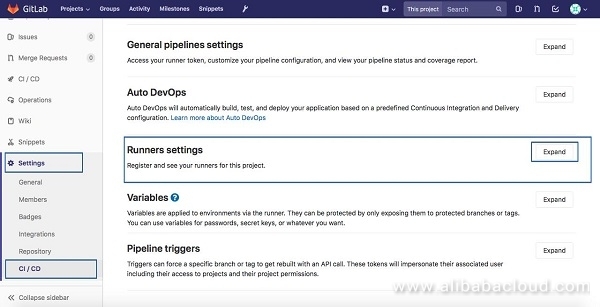 In this tutorial, we will learn how to set up continuous integration and continuous deployment (CI/CD) with GitLab on an Alibaba Cloud Elastic Compute Service (ECS) instance. Before we start the tutorial please log in to the console and get ready. New to Alibaba Cloud? Sign up for a free account and try over 40 products for free worth up to $1200. Alternatively, visit Getting Started with Alibaba Cloud to learn more. How Continuous Integration(CI) and Continuous Deployment (CD) evolved? Once we get the requirements from the business team, the development team takes care of transforming the requirements into some form of functional code in the form of software. The whole activity is mostly performed within the development environment. 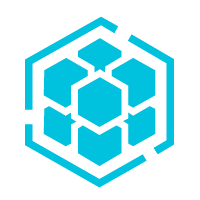 The development might take months or years depending upon the requirement once this activity completes, the whole project is given to the operations team to test, deploy in the production environment. Once the project is handed over to the operations team, this team is responsible for testing, deploying, maintaining the code in the production environment. Most of the times the production environment is not similar to the development environment. This difference results in many issues (such as dependency error, performance issues & environment issues), If the team recognizes the error is at the application level then it escalates to the development team and then the whole process cycle again. If there is an error due to the environment, then the operation team fixes it, deploy the project in finally make it available to business users. Once we get the requirements from the business team, the development team and operations team together work on deciding different configuration parameters for the environment. This collaboration ensures that the development environment is similar to the production environment or at least no issue arises when the developed project moves to the production environment. Using different tools like Gitlab for version control and many others, there are real-time reports for both the development team and operations team to see how the project is performing. Using different services like resource orchestration service, the operations team able to create and manage the service using a simple configuration this reduces much overhead to the operation. This process also requires each team having a basic idea of what other teams were doing within the project. GitLab Community Edition (CE) is an open source end-to-end software development platform with built-in version control, issue tracking, code review, CI/CD, and more. Since we are working with Gitlab continuous integration, we need a Gitlab instance installed on an Ubuntu 16.04 server on Alibaba Cloud Elastic Compute Service (ECS) instance. GitLab recommends a server with at least 2 CPU cores and 4GB of RAM. GitLab CI/CD is a part of GitLab, a web application with an API that stores its state in a database. It manages projects/builds and provides a friendly user interface, besides all the features of GitLab. Integrated: GitLab CI/CD is part of GitLab. User Friendly: GitLab CI/CD offers the same great experience as GitLab. Familiar, easy to use, and beautiful. 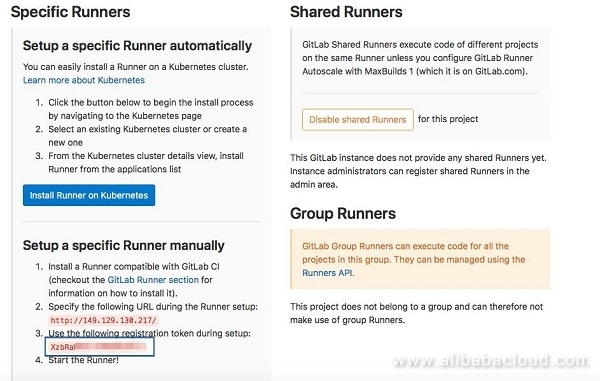 GitLab Runner is an application which processes build. It can be deployed separately and works with GitLab CI/CD through an API. Using Gitlab CI Runner, we automatically check out the code and execute the test to validate the new changes. To make the testing environment independent of the development environment. 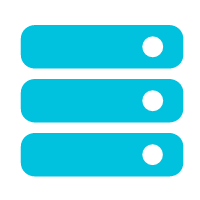 We run all our tests within Docker Containers. To do this, we set up the docker environment on where the Gitlab CI runner gets installed. This confirms that you have properly setup Docker on your instance. Now to start the GitLab CI setup, we need to have a repository. Let's start by cloning one from GitHub to GitLab. I will be using the following repository for demonstrating the Gitlab CI. The below is a NodeJS application. Click on "New Project" and select "Import Project > Repo by URL" option in the below screen. 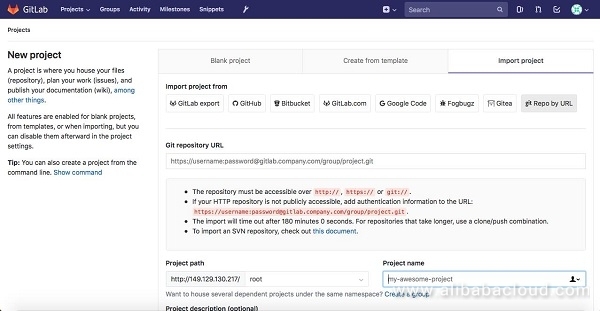 Paste the Git Repository by URL provided at the start of the section and update the "Project name," "Project description" & "Visibility Level" as required and choose Create Project. These are the stages we will define while testing the code, the above definition reads to "Perform the build and once it is successful, then the test will be performed". Jobs with in the same stage are performed in parallel. These are just the tags we will create but the actual definition will follow next. There are 3 stages that Gitlab provides "build", "test" & "deploy"
Then we will create a cache to store the node_modules (dependencies in a node project). So that we can use these files across the stages. 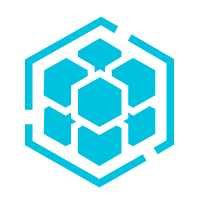 This is the first job (install_dependencies) will detail the steps for installing the node dependencies. The 'script' tag is used to specify the actual script in the job. The "paths" specify where the output of the job will be saved. The "test_with_lab" job will perform the test once the "install_dependencies" job is successful. We will trigger a job in Gitlab by committing a new file to the repository. We will create a .txt file with some text and "Commit Changes." Once the commit is done you will see that small pause icon showing in the pending state. If you see the detail information of the job, "The job is stuck, because the project doesn't have any runners online assigned to it". Since we don't have any runners configured for the job we see the job in paused state. The above script will help manage the Gitlab Runner packages from the same repository. We can install the Gitlab runner once the script is successfully executed. This will install and start the Gitlab runner service. Save the URL and the token highlighted in the above picture as we need it while setting up the Runner. Congratulations! 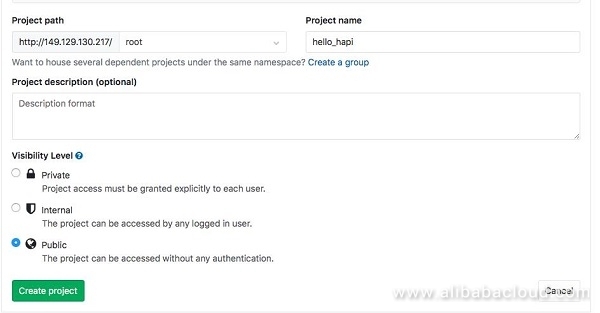 You have configured GitLab CI on an Alibaba Cloud Elastic Compute Service (ECS) instance along with your GitLab CE. This helps developers to run and test the features easily within the version control.